The baron and boggy moors of West Yorkshire gave birth to the likes of My Dying Bride and Paradise Lost. 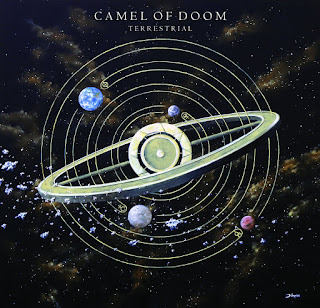 Camel Of Doom (while being active for large parts of the last 16+ years) are new to this writer, but they seemingly fit alongside both of those bands thanks to their own take on the stoner/doom blueprint. "Terrestrial" was released in February 2016 via the band and Solitude Records and is their fourth full-length; however, the PR wheels are still in full motion hence this review. Right from the very start of “Terrestrial”, you get a sense of British (and indeed Yorkshire) doom is so well revered. Cycles (The Anguish Of Anger) is a flowing and majestic journey through nearly thirteen minutes of orchestral, progressive doom. It has all of the usual genre trappings like the lurching riffs, precise drumming and low growls, but there’s more to it. Keyboard textures and brief electronic forays add to it’s textures alongside ambient soundscapes, like the ones present during the mid-section of Cycles. The calming ambience and heavy doom comes together in the latter section with menacing intensity. A Circle Has No End has both an amusingly factual title and an amazing musical quality, especially for a song that merely breaks up two huge songs. Pyroclastic Flow is the musical equivalent of being buried by molten ash. it makes everything darker and more acrid. The riffs in the song are more off-kilter and more metallic, leading to something that’s a lot more progressive. Some people’s visions of UK doom and stoner are very rigid, because sometimes it can be a bit same-y. You’ll get no such feeling when listening to this song, or indeed the album. Camel Of Doom’s music gradually increases tempo with Singularity and it’s near mix of psychedelic stoner and death metal forays. The noisy and oddly occult-sounding electronics of Nine Eternities lead into another slow number in the form of Euphoric Slumber. It is actually quite euphoric for a doom song, which is a strange thing for me to say but you’ll understand when you hear it. There’s a subtle gothic charm to Sleeper Must Awaken, due to the semi-clean/whispered vocals throughout. It plays further on the band’s psychedelic influences and even contains some punk vibes. I hope I’m not sounding to pretentious. It reminds of a band (whose name I can’t think of right now, but maybe Big Business). The song becomes both tumultuous and breathtakingly beautiful in equal measure, before pausing briefly and flowing into closing tome Extending Life, Expanding Consciousness, which seems to do just that with glorious keys. I may not have written a huge essay about “Terrestrial” here, but sometimes fewer words mean more. This is a spell-biding album that makes the extremities of doom metal pleasurable and more accessible. Camel Of Doom have made that possible and are more than just another band.